Adobe Photoshop CC for Photographers by Photoshop hall-of-famer and acclaimed digital imaging professional Martin Evening has been revamped for a thirteenth edition to include detailed instruction for all of the updates to Photoshop CC on Adobe's Creative Cloud, including significant new features, such as faster Camera Raw processing, Blur Gallery noise matching, and new export options for quick image-saving and layers as separate documents. This guide covers all the tools and techniques photographers and professional image editors need to know when using Photoshop CC, from workflow guidance to core skills to advanced techniques for professional results. 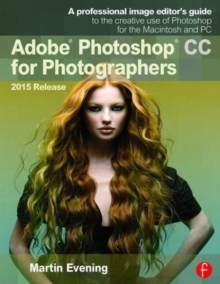 Using clear, succinct instruction and real world examples, this guide is the essential reference for Photoshop users. Accompanying the book is the photoshopforphotographers.com website, fully updated with new sample images, tutorial videos, and bonus chapters.